Out of curiosity I wanted to try a 360 camera. The Ricoh Theta SC was the cheapest by far, so I took the plunge. The Theta can be used in two ways - with or without the associated Theta app. 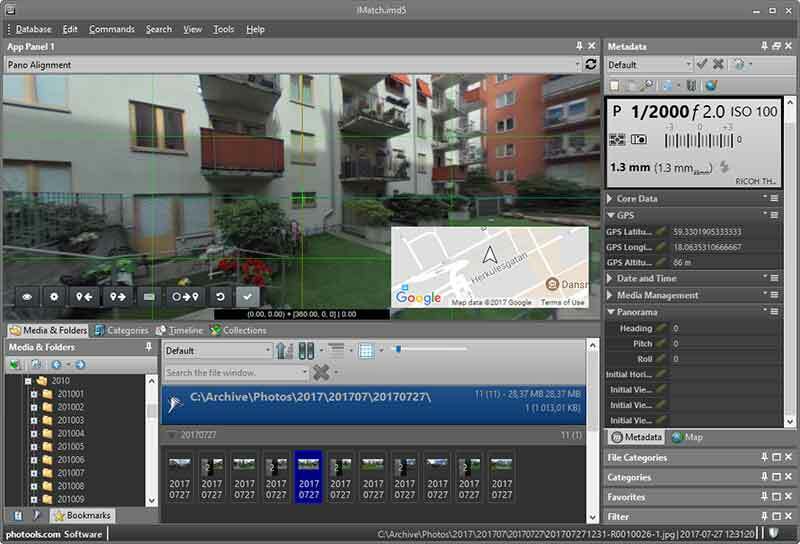 Without the app, it has a very simple user interface: there's one button that, when pressed, will either take a single 360 photo in fully automatic mode, or start / stop recording. The upside is that you don't have to hold the camera in one hand while working your phone with the other - starting the app, connecting to the Theta's wifi-network, pressing the capture button and so. The downside is that your finger will end up in the photo, meaning that a portion of the 14 megapixel output will consists of whatever is under your thumbnail. 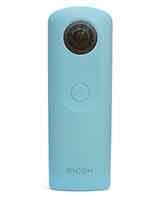 Consequently, you probably want to use the app and remote-control your Theta - even if you're just holding it on a tiny selfie-stick. If you want to be completely outside of the photo there's an additional problem: you'll have to hide behind trees, pillars, bushes, etc. The Theta is just like the dopefish[a] - if you can't see it, it can't see you. But if you don't have a good line of sight to the Theta, you'll find that your wifi connection drops. Using the self-timer won't help you here, as the timer is in the app and not in the camera. The end result is that you kind of end up playing hide-and-seek with your Theta. You could, of course, set the app to self-timer, leave the phone with the camera, and then go hide. I'd probably use a throwaway phone for that, though, as I don't like leaving expensive electronics with personal information on them out of sight. There's also the possibility of taking two photos in sequence from the same spot, one with you standing in each hemisphere, and then editing yourself out, if you don't like playing hide and seek and can stomach the extra post-processing work. The Theta isn't a camera for high-quality images in the technical quality sense. It produces acceptable snapshots for, for example, uploading to Facebook. That said, having a very compact 360 degree camera means that you can get immersive views from places where you would not be able to fit a DSLR and a panoramic mount, which can result in images that may not have very high technical quality, but that could be very fun to view anyway. The Theta will register its orientation in the pitch and roll axis when a photo is taken, but it won't be able to tell you which way north is. If you intend to upload the photo to Google Street View, for example, you'll have to add that information yourself. I ended up writing an app for IMatch[b] to orient and level photos, but this may be overkill for most. For editing 360 images I tried Affinity Photo[c]. The jury in my head is still out on this one. While it has the best user interface for clone-stamping on 360 images thanks to the live perspective transform, the user interface has a lot of other clunkiness that ensures Photoshop will keep being my go-to solution for photo editing. A nice little camera that gives you new creative possibilities, but which must be employed with some thought in order to realize its potential and not end up unused once the novelty has worn off.